Ok, excuse how unbelievably crazy my hair is in these pictures but holy smokes was it windy out when I took these! I guess being down by the water didn't exactly help but I had such a hard time getting some good shots in because my hair was all over the place and keeping the dress down was quite the task! But I am totally loving this dress! I love the colorblocking and the palm print, I know I've said it before but palm print is definitely my favorite print this summer and I love the fun twist on this one! The dress is a little long on me (but then again I am really short) however it's perfect for work and looks great with heels! The print on that dress is so fun and love different colors!!!! I can't believe it's June either, where had the year gone? I have this dress and I'm obsessed! I wear it to work so much - and it'll definitely be on the blog in the next couple of weeks! Love how you styled it, girl! 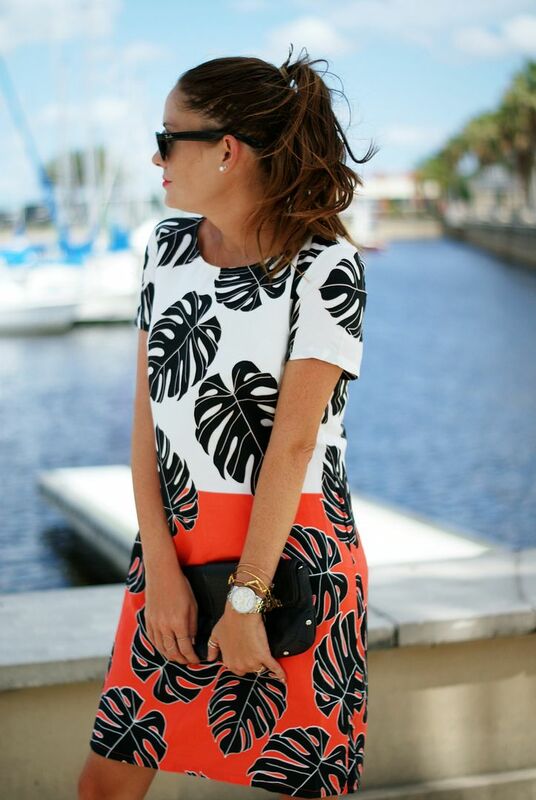 Oh my goodness, that Palm print is so beautiful on you! So unique. Of course you look stunning in anything! :) This dress looks like they made it just for you, like they designed it thinking oh Pamela from Sequins and Sea-breezes is modeling this for us!!!! Happy Wednesday beautiful!! 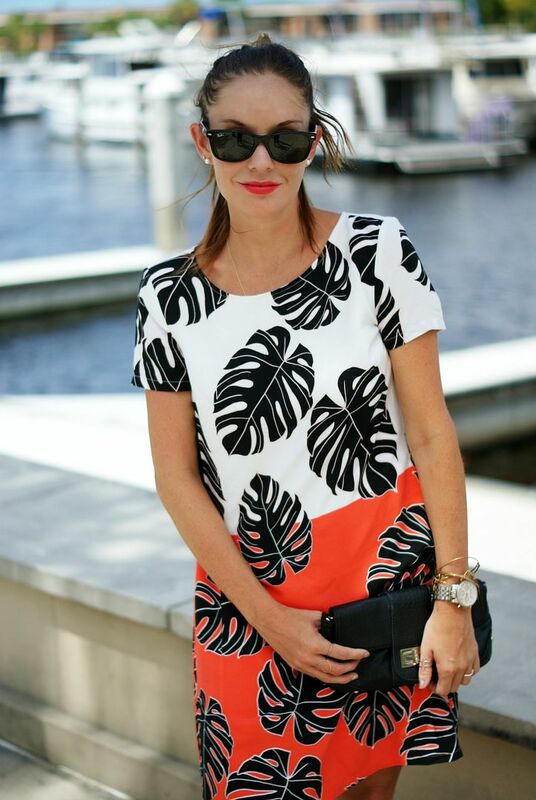 Such a cool dress - love that you have your hair pulled back and super cool sunnies on. You look ready for an adventure! Hahahaha isn't shooting by the water fun!? I seriously hate it but love the background! It's so hard not having your hair go all over the dang place! Seriously loving this dress!! The color blocking mixed with the palm print is so unique! Love the orange too! So pretty! Omgsh I almost bought this dress when I was there the other day, but was worried it would be to short on me hehe--it looks fabulous on you--loving the colors!! Omg, love this dress on you! You look so chic, but the print keeps it fun. Love it, girlie! This is gorgeous! I love this print and the colors in this dress make it a little more unique! This is probably one of my favorite palm prints I've seen lately! I'm still in awe that it's June, too - I mean the year is already half over! Fell in love with this dress at the store but they didn't have my size, think it's time to order it online! I can't believe it's June too and it's actually cold here today so it feels nothing like summer! I love this dress! The combo of colors is perfect and I love the style of t-shirt dresses so it's perfect! Such a cute shift dress! I love them on other people but just don't think I have the shape for them. LOVE that dress!! Looks great on you too. I also love your lip color, so pretty!! Such a pretty dress! I would have never thought it was from ON...just doesn't look like their typical style clothing. Love the windy marina pics! Gorgeous dress and so jealous that you can rock a pony and still look beautiful. I really need to purchase something palm print...I haven't gotten around to it yet! Love this dress! Yay for June birthdays, mine is next week!! I seriously need this dress!! It's insane that we are 1/2 way into 2015 now! Love this dress and you are rocking it girl. the color blocking is fantastic! and i like the ponytail with the dress too! wind or no wind! This dress is fabulous!!!! The print and colors go so well together. Also, it is so different. I get tired of seeing the same few dresses everywhere...this is gorgeous! YES to palm! My favorite pattern this season, for sure! I love palm print!! Such a perfect summer trend :) and your hair is gorgeous! models always have their hair blowing in the wind so I'd say you're basically a model! OMG that dress is too cute! I need it!! I love the boldness of this dress! I am seriously so in love with this dress, perfect for summer! This dress is such a fun pattern, what an amazing find! !